Fabulous dog accessories designed & crafted in America. Announcement Thank you for shopping with us, we are thrilled to handcraft a beautiful collar or accessory for your pup! We offer Black plastic hardware and silver aluminum hardware in all sizes, matching leashes are made to match and it comes with silver hardware. Gold buckles available only on the 1" width. Please note that Pattern placement might vary by size. Email me your request for custom fabric or sizes. *Chain martingale M/L 11"-17" L/XL 12"-21"
Our items can be hand washed or machine washed in gentle cycle with cold water. We recommend you put it on a laundry bag to protect the hardware. Lay flat to dry. Accessories we recommend spot clean only. We shipped using USPS, and you will be notified when your item ships.. You can expect your items to be shipped within 1-3 business days. Please allow and extra 5 days for delivery. Please request a cancelation within 24 of purchase. Due to the fact that each WAG MORE product is handcrafted at your request, we do not accept returns. Please be sure you are ordering with our SIZE CHART in mind and always measure your dogs neck prior to ordering. If a collar or leash needs to be exchanged for a different size, there will be a $10 production charge per item that must be remade. Merchandise should be returned in its original unused condition. The customer is responsible for paying shipping fees associated with exchanging an item. For exchanged goods, please note that the item is your responsibility until it reaches us. Therefore, for your own protection, we recommend that you send the parcel using a delivery service that insures you for the value of the goods and provides you with a tracking number. 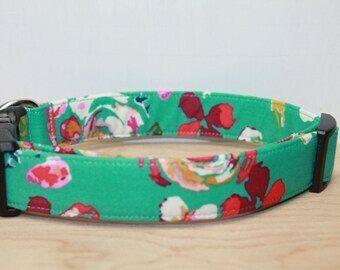 Please note that exchanges are not applicable for custom embroidered collars. Thank you for shopping our products. Thank you for shopping with us, we are thrilled to handcraft a beautiful collar or accessory for your pup! Turquoise & Red Floral Dog Collar - Floral Dog Collar - Vintage Inspired Dog Collar - Girl Dog Collar - Summer Dog Collar "The Lilliam"
Green Sea Turtle Dog Collar - Sea Creature Dog Collar - Green Dog Collar - Blue turtle Dog Collar - Blue Collar "The Dodo"
Cool Dog Collar / Map Dog Collar / Colorful Dog Collar / World Map Dog Collar / Adventure Geography Gift / World Traveler / "The Wonderer"
Berry Pink Arrow Dog Collar - Modern Geometric Design - Girl Dog Collar- Fabric Girly Collar - Adventure Dog Collar "The Pink Arrow"
Mint Green Aztec / Geometric Dog Collar / Tribal Inspired / Southwest / Stripped / Navajo / Wag More Dog Collars "The Hound"
Floral Dog Collar, Spring Vintage Inspired Fabric, Blue Flower, Pink Flower, Beautiful Rossettes. "The Rossy"
Pineapple Dog Collar - Summer Dog Collar - Fruit Dog Collar - Green Dog Collar - Beach Theme Dog Collar - Tropical Dog Collar "The Myrtle"
Pink Flower Dog Collar , Summer Collar , Lilly Dog Collar , Hot Pink Dog Collar , Pink Rosettes Dog Collar Trendy, Girly and Fun"The Lilly"
Classic Dog Collar, Bright Red Gingham, Dog Collar for Summer. Plaid Dog Collar, Unisex Dog Collar. " The Emma"
This is Rue. She is very happy with her new collar, she has difficulty concentrating on just one thing. Rue ( and her people ) thank you. Red Dog Collar / Bike Dog Collar / Red Bike Dog Collar / Bicycle Dog Collar / Vintage Inspired Bicycle Pattern / Dog Collar "Red Bike"
Monkey Dog Collar / Brown Dog Collar / Vintage Inspired Fabric / " The Silly Monkey"
Love the metal buckle and personalization! Thank you! Great to have a matching leash! Very well made!! Thank you! My little girl looks so cute in this collar!! Love it! Lady Bug Dog Collar - Bugs Dog Collar - Ladybug Dog Collar - Ladybugs Dog Collar - Spring Dog Collar - Cool Dog Collar "The Gardener"
Rope leashes available in many colors. Did you know that we can embroider your puppy's name onto your collar or leash. Simply add on the embroidery upgrade onto your shopping card. Embroidery Upgrade Add-On. Does not include collar, collar sold separately. Add name to the collar. Notate thread color preference. Our mobile store, so many collars to chose from. Set up at our local market. I handcraft each collar from my home studio, in company of our happy children and loving dogs. We pride in using the best quality materials & fashion forward fabrics. Each product I made is carefully made at your request. Thank you very much for supporting our small business. We are able to monogram your pups gear with their name, to do so please purchase an embroidery upgrade on our shop. Personalized products can't be exchanged or returned. On each listing there is information on sizing, please take a look before ordering and send us a message if your pup needs a size that is not listing. We are glad to accommodate your needs. Wag More Dog Collars items can be hand washed or machine washed in gentle cycle with cold water. Air dry only. Accessories, we recommend you spot clean it only. We offer wholesale, please message me at wagmoredogcollars@gmail.com for details. Our items are custom made by hand per order, we ask our clients to measure theirs dog's neck and select a proper sizing during checkout for a guaranteed fit. We hope that you are completely satisfy with your purchase and if for some reason you are not, contact us within a week and we can work it out... Please do know that if I am able to exchange your product you will be responsible for shipping back the unused item and pay shipping to receive the new one. If an error was made on our end we will try our very best to make it right.